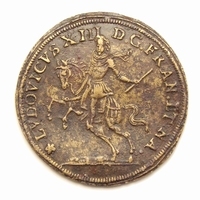 Obverse: King Louis XIV facing, holding sceptre and baton; helmet on table before him. Legend: LVDO.XIIII.D:G.FR ET NA REX CH. 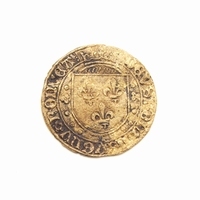 Reverse: Henri IV as Mars clasps the hand of Marie de Médici, represented as Pallas (Minerva). An eagle holds a crown over the Dauphin, their son Louis who has his foot on a dolphin while trying on his father's helmet. Legend: PROPAGO.IMPERI.1618 (the offspring of the Empire).